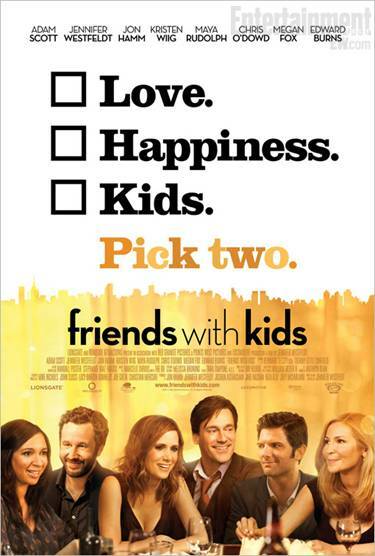 Friends with Kids: Coming to Theaters March 9, 2012! 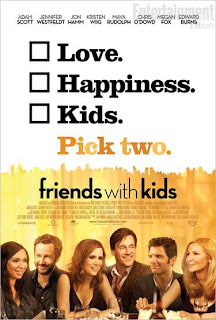 On March 9, 2012, the cast of Bridesmaids reunite in Friends With Kids, a daring and poignant ensemble comedy about a close-knit circle of friends at that moment in life when children arrive and everything changes. The only two singles in the group observe the effect that kids have had on their friends' relationships and wonder if there’s a better way. They decide to have a child together....and date other people! Jennifer Westfeldt wrote, directed, and stars in the movie. She plays Julie, a Manhattanite whose biological clock is about to run out, so she convinces her longtime platonic best friend, Jason (Adam Scott) to father a child with her. They seem to have a much easier time juggling the responsibilities of new parenthood without the complication of being in a relationship with each other, which is in contrast to the two couples they are closest to. As their friends' marriages implode, Julie and Jason's happy equilibrium topples over as well when he falls for a hot young artist (Megan Fox) and she begins dating a successful businessman (Edward Burns). Will you go see this movie?! Friends With Kids stars Adam Scott ("Parks and Recreation"), Jennifer Westfeldt, Jon Hamm, Kristen Wiig, Maya Rudolph, Chris O'Dowd, Megan Fox and Edward Burns.